Availability: 1 week for local NY, NJ, & CT. 2-3 weeks for other areas. The Marcell wheat-back counter height bar stools in a warm, medium walnut finish will be a great addition to your casual contemporary dining collection. These stools feature a high back with an open, grid pattern for a unique style with sleek, square tapered legs. A padded seat covered in soft mocha microfiber fabric adds to the comfort and durability of these stools. Pair with a counter height table or the bar unit from the Marcell collection for a stylish look that fits your casual dining and entertaining space. The Marcell collection offers casual contemporary dining solutions for any home. The clean lines, smooth edges, warm, medium walnut finish and the ideal blend of style, comfort, and function makes the Marcell collection a must-have for your home. 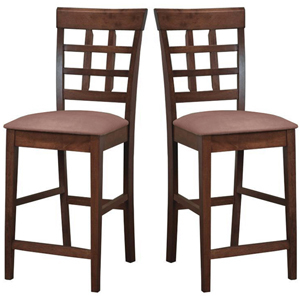 The above price is for the pair (2) bar stools. • Warm, medium walnut finish. • Available in 24" or 30" seat heights. • Open, grid pattern backs. • Padded seat covered in soft mocha microfiber fabric.